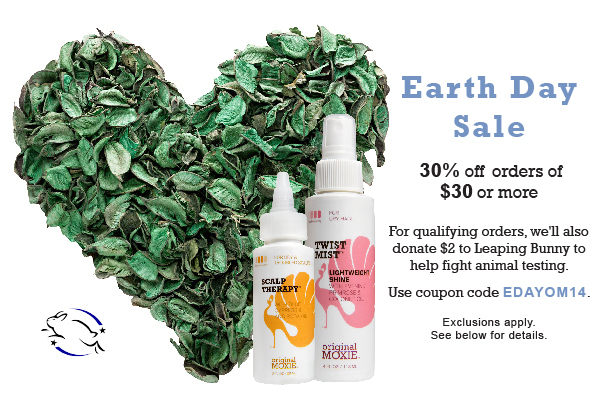 Original Moxie is celebrating Earth Day with one of our largest sales of the year! Friday April 18th – Tuesday April 22nd, get 30% off orders of $30 or more with coupon code EDAYOM14. For every qualifying order, we will donate $2 to Leaping Bunny to support Cruelty Free beauty! The Leaping Bunny Program provides the best assurance that no new animal testing is used in any phase of product development by the company, its laboratories, or suppliers. We’ll be continuing our celebration of all things earthy with a series of posts on how we commit ourselves to cruelty free & eco-friendly practices. Stay tuned! Coupon code for use on retail orders only. Gift sets and kits are excluded. No rain checks, no cash value, limit one per customer. Valid Friday, April 18th – Tuesday, April 22nd.